Well today its World Book Day. 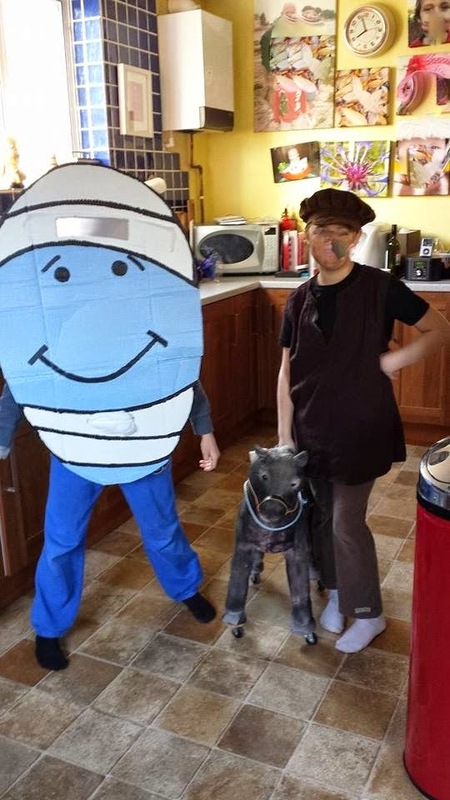 Now, since my children moved to a new primary school (their old one didn't bother with this day for dress up or many other days for that matter), we have entered into the spirit of dressing up in a book character. Maybe that's why I don't mind it so much - I haven't had to make these outfits for 7 + years plus I'm just happy that the kids now go to a school where some fun is going on. Only last week, they had Paul Geraghty, Author who writes and illustrates his own children's books. The kids were so inspired by his visit and his drawings. So much so that when they came home they had drawing competitions and told me how you go about illustrating a scene in a book. In addition, they had their individual chosen book signed by the author himself. My son, who flits between wanting to be a spy, author, scientist and Tour de France winner feels now it would be better to concentrate on the children's book market as he feels its more profitable! 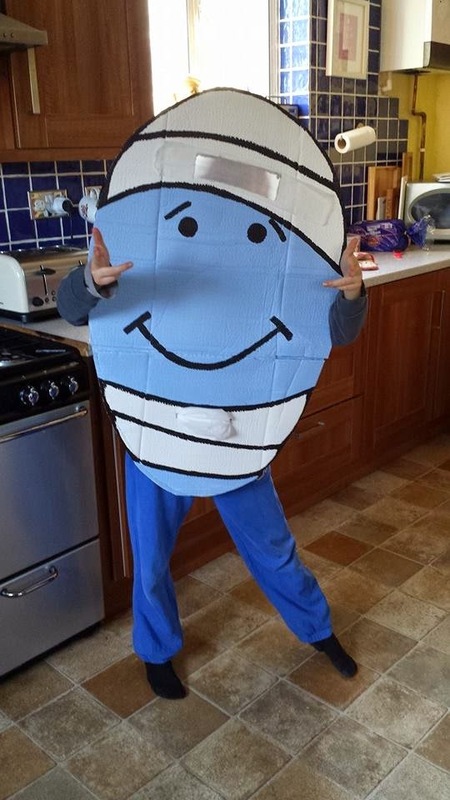 Anyhow, last year you may remember we got well and truly into the spirit of things with our Diary of a Wimpy Kid outfit. Well, this years creations were Mr Bump, War Horse and Stick Man. I love the book Stick Man. Now, my self imposed brief for making these costumes, is that it costs little or no money and all crafty supplies must be found around the house. 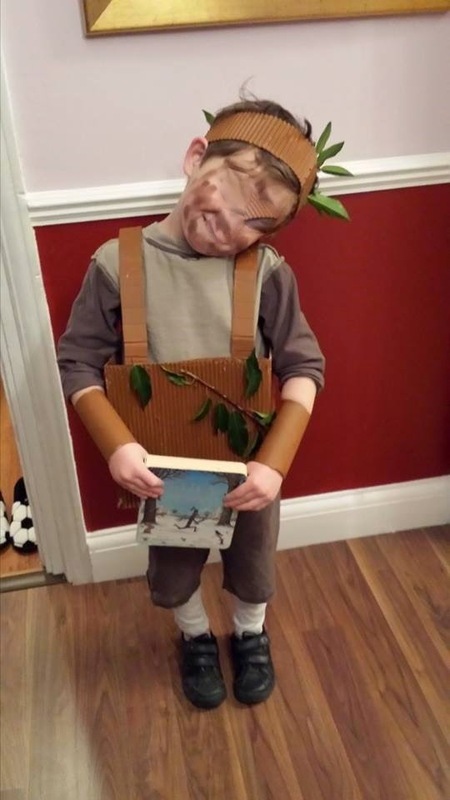 Cardboard is your best friend for World Book Day that and PVA glue, paints and a stapler. Oh and my husband. Ok so its not all cardboard. We had an old pony (as you do) knocking around and my husband had put wheels on it. He sprayed it grey. I had an old hat from an Oliver Twist day, a smock top from a nativity and brownie leggings. Brown eye shadow for dirt on the face. This is possibly my finest hour as had no help. Copied straight from google images. Used a cardboard box (balloon time and stripped it back to give stick effect. Painted brown. Used loo roll for arms. Had to cut it short so he could sit down and added leaves. Only thing is my youngest never got to wear it! He started throwing up from 4.00 am onwards and is currently lying next to me in between throwing up bile. Nice. I have never known him to be so sick. I reckon he's had 7 days off sick since he started reception. That's probably more than my other two in their entire primary school years! He is a bugger for sucking his finger but I am religious about hand washing etc. Urgh hurry up and finish reception year. In other news, I completed Week 4, day 1 of the C25K - I did plan to do day 2 today but see above. I managed to run for 5 mins without stopping and then later on another 5 mins so of it was up hill also so I felt very chuffed with myself. Couch to Losing 2 Stone! Do You Really Know What Dementia Is?